Punalur is a significant city of southern Kerala. It is the second largest city of Kollam district and holds its importance since the ancient times. Historically, Punalur has witnessed many civilizations and empires. It was inhabited since Mesolithic period. There are evidences to prove its existence since pre historic times. The city has always played an instrumental part in the history of South India. It rose to prominence during medieval period due to its agricultural richness. It was a major trading hub in this part of the country. It is quite interesting to know how this city got its name. Punalur is derived from Malayalam and Tamil languages. Punal means river in Tamil while Uru means place in Malayalam. Hence, the name Punalur was given to this place due to traversing of rivers through this town. Another belief refers to the epic era of Ramayana. It is said that it was during this era, Khara was trying to kill Lord Rama and Lakshmana with his sword. He took it out of sheath firstly at Karavaloor but could not succeed. So, he again took it out at Punalur. In Malayalam, Punar means again. Punalur is aptly situated next to the mighty Western Ghats. As such, it has always been a prominent human settlement since long time. In some archaeological surveys, it was found that this city existed ever before The Indus Valley Civilization. It was then known as Shenduruny Valley civilization. Shenduruny is the ancient name for River Kallada flowing through this city. In the north western part of this river, a large cave has been found with remains of Stone Age. These Mesolithic remains prove the existence of a prehistoric human civilization in this region. As per the expert historians, this civilization flourished here somewhere between 5210 and 4420 AD. There are marshy lands outside this cave that has capacity to hold around 20 persons at a time. All through its medieval history, Punalur was a centre of spice trading and agriculture in this entire region. It was closely located near Tamil Nadu and had strong ties with this state for economic development. During this phase of time in 1552 AD, a Portuguese, Captain Drigs tried to control the spice trade of this place but the local traders refused to co-operate with him and they sent all the black pepper loaded in 500 carts to Tamil Nadu. Irked by this act, Captain Drigs invaded the region with his soldiers and killed many innocent people. The significance of this city in trading continued as such till the later times. Till 1734, it was under the regime of Ilaydathu Swaroopam. Its reign was later shifted to Travancore Empire and then, it passed on to British Raj that showed keen interest in Punalur because of its huge agricultural potential. Punalur was a prime centre for the freedom struggle and movement against the rule of Diwans in this region. Its closeness to Tamil Nadu made it the centre for planning the activities of freedom fighters. In 1880, thieves attacked the taluk Pathnapuram. Due to this attack, the taluka headquarters were shifted from Pathnapuram to Punalur. It was a moment when the history of this city was recreated with glory. 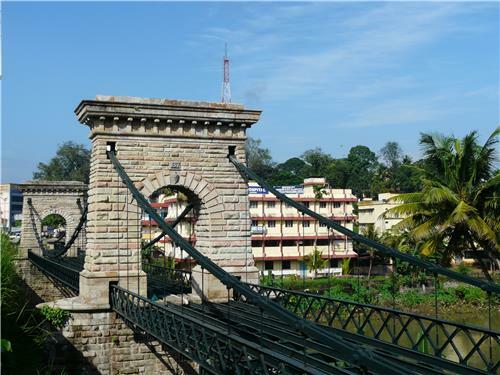 In 1877, a suspension bridge was built in Punalur by British architect Albert Henry. This was the only suspension bridge in the entire South India. This landmark made Punalur the hub of trading with transportation facilitated by this bridge. It took six years to construct this massive bridge which is 400 meters long. Later on, another feather in its cap was added by Kollam to Thiruchendur railway line that connected Punalur to many major cities of the state. During this period, rapid development took place in Punalur. It was gifted with Punalur Paper Mills in 1888. This mill offered many job opportunities to the local people and led the economic progress of this region. The workers of this mill actively participated in the freedom movement and fight against the Diwans. This was a golden era for growth of Punalur. Sri Ramapuram Market established during this era by the Maharaja of Travancore is still one of the largest agro markets of Kerala. Many timber and plywood industries were established at that time in this city. Apart from the trade, culture of this region also flourished during the modern period. Arts, cinema, dance, and drama came into the mainstream of people in Punalur with remarkable contributions made by the local artists.